Measures 64.6 Sq m or 695 Sq ft. The stunning living room has a bank of sliding glass windows with uninterrupted views of St Paul’s Cathedral, the Shard and the City of London. The apartment has one bathroom and two bedrooms all located on the 4th floor. There is a sofa bed which can be made up with advance notice. Perfect days in London, our apartment was perfect. Angela was an amazing host. She was courteous and prompt to respond. The house was beautiful. The picture do not do it justice. The location was prime, and the cost affordable. The maid service was excellent as well. It was worth every penny. Do not hesitate to book this property. Cool place to stay , stayed many times as well as putting friends I touch . Sadly standards are slipping , not as clean as it once was , starting to look quite “used” bed in our apartment needs to have a serious investment in buying a new one . Shower holder also not stable, even though basic cleaning done daily ( excluding weekends ) they might as well not bother , we arrived to a carton of stale milk in apartment, oven tray not cleaned out, various items under bed from previous tenants.top of bin in lounge sticky to touch .. Love this location, but flat needs a freshen up and cleaning standards need to be as they were when we first found u almost 3 years ago .,great storage space ,a little bit too warm with this past freaky summer , as u can’t open windows, although stand up fans provided helped .You will love these apartments, but they are starting to lose their charm over time . Excellent apartment suitable for a family and group. The apartment has all the necessary applicances and utensils . We had an enjoyable stay . Angela was very helpful from the beginning until the end of our stay . Responded quickly to all our queries and requests. No doubt we will choose to stay at this apartment the next time we visit London. If I may recommend probably to have a cooler in the apartment especially at the bedroom on the upper floor during summer . Excellent choice for a family. Warm, hot water, fully equipped kitchen! 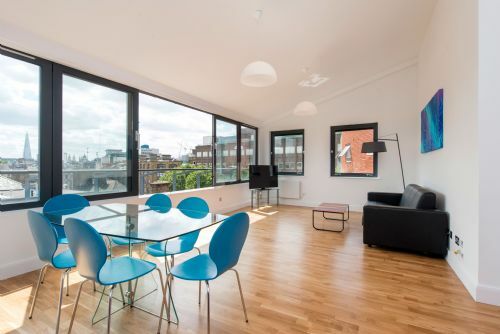 Walking distance to the tube and just 40 minutes walk to the City. Great stay, no problems at all. This flat was perfect for our family of 4. Clerkenwell is located close to everything and the flat is just steps from bus stops and a couple of blocks from the underground. The flat is comfortable and provides all that is needed for a comfortable stay. We would really recommend this flat for families and anyone who prefers to have a little space and true London neighborhood feel. There are plenty of local restaurants that are only a couple of blocks away. The only change we would recommend is the addition of the SkySports channel for watching some of the football matches. Good flat, but no a/c ! We were burning in the last few weeks because the wether was very hot ! And there was no a/c. The windows were all bad because you can't fully open them. As well as the room on top, it was like hell for us ! Because it doesnt have a window and it was very very hot up there in the room !! We are disappointed to read this review and do not feel that the comments are particularly fair. Nobody has ever complained about being too hot in the apartments and we could have provided fans if you had asked. You came into the office to extend your stay and made no mention of the apartment being too hot or uncomfortable. The windows have restrictions for safety reasons. You are on the fourth floor and we cannot risk a child falling out and injuring themselves, safety is of utmost importance. If you have any further issues with the apartment perhaps you could direct them with us so that we can try to resolve them.